The US State Department and the Federal Bureau of Investigation are willing to pay a total $4.2 Million for information leading to the arrest and/or conviction of top 5 most wanted cyber criminals accused of conducting frauds of hundreds of millions of dollars. 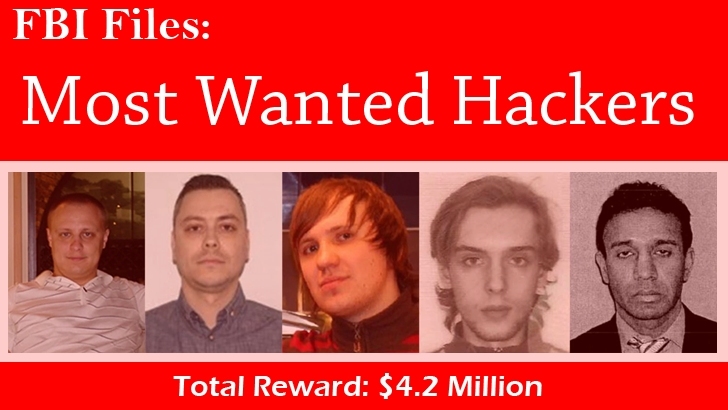 Evgeniy Bogachev,30; Nicolae Popescu, 34; Alexsey Belan, 28; Peteris Sahurovs, 26; and Shailesh Kumar Jain, 45; are in the list of FBI's Top 5 most-wanted hackers. Evgeniy Mikhailovich Bogachev, also known under the aliases "lucky12345," "Slavik," and "Pollingsoon," is the mastermind behind the GameOver Zeus botnet, which was allegedly used by criminals to infect more than 1 Million computers, resulting in up to $100 Million in losses since 2009. Besides GameOver Zeus botnet, Bogachev is also accused of developing CryptoLocker Ransomware, which was designed to extort money from computer victims by holding their system’s files hostage until the victim pays a ransom fee to get them back. Bogachev tops the FBI target's list with $3 Million in reward for anyone giving the information leading to his direct arrest and/or conviction. Nicolae Popescu, who also used the aliases Niculae Popescu, Nae Popescu, Nicolae Petrache, "Nae", and "Stoichitoiu", second topped the FBI's 5 Most-Wanted Cyber Criminals list. This 34-year-old Romanian is accused of fooling innocent Americans with fake auction posts on several websites, including eBay, Cars.com, and AutoTrader.com, claiming to sell cars that just didn't exist. Popescu and other criminal hackers affiliated with the scheme made more than $3 Million off the auctions, victimizing almost 800 users who handed over money for imaginary cars, Rolex watches, yachts, private airplanes, and other luxury goods. Authorities tracked down and arrested six members of the cyber gang in late 2012, but Popescu and a partner slipped away. Alexsey Belan, a Russian national, is wanted for allegedly stealing consumer data by compromising the cyber security systems of three unnamed major US-based e-commerce sites in Nevada and California between 2012 and 2013. After stealing and exporting user databases with passwords to his server, Belan is accused of allegedly negotiating the sales of the databases. Peteris Sahurovs is accused of developing and selling a computer virus through advertisements on news website pages. He allegedly carried out the scheme from February 2010 to September 2010. Under the malicious scheme, the fake ads displayed on the web pages forced users to purchase fraudulent antivirus software. In case, a user refuse to buy the software, the victim’s desktop would be flooded with pop-ups and fake security alerts. Sahurovs, a native of Latvia, made more than $2 Million by selling his "antivirus" software. Shailesh Kumar Jain is the only American citizen on the FBI’s Most Wanted Hackers list. Jain made $100 Million between December 2006 and October 2008, according to the FBI. He used a flood of pop-up ads and email scamming to convince users that their computers were infected with a virus and then selling them the bogus AV software packages for between $30 and $70.